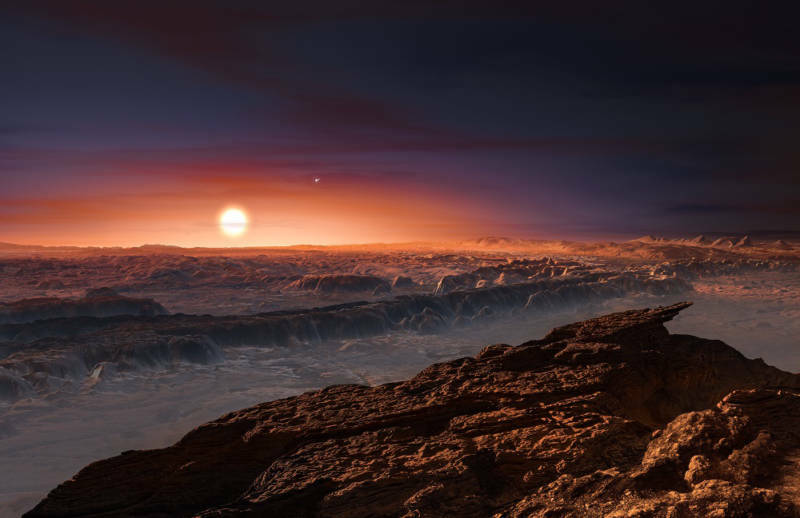 The newly discovered planet orbits Proxima Centauri, a red dwarf star that's just 4.25 light-years from Earth — about 25 trillion miles away. The star is too faint to be seen with the naked eye and is close to a much brighter and more famous pair of stars called Alpha Centauri A and B. Researchers detected the planet by observing how its star wobbled as the planet traveled around it. All that's known about the planet is that it's a bit more massive than Earth and circles its star once every 11 days. Because the star is so dim, temperatures on the planet would be mild enough that any water — if it's there — would be liquid. "We're talking about a planet that has very similar properties to Earth," says Guillem Anglada-Escude of Queen Mary University of London, who led the research team of more than 30 scientists around the world. They have called their campaign to discover this planet Pale Red Dot, after astronomer Carl Sagan's observation that, from other solar systems, Earth would look like a pale blue dot. Despite some similarities to Earth, if you could stand on this other world, it would still look plenty alien. That's because it is likely that only one side of it ever faces its star. Looking up from the planet's surface, the star would seem stationary in the sky, says Anglada-Escude, and is so orange that if the planet had an atmosphere like ours, the heavens would perpetually have the color of "a late autumn sunset." Scientists have discovered thousands of planets orbiting distant stars, including a bunch that might be potentially habitable. The proximity of this new planet means scientists will have an easier time doing follow-up studies to learn more about it and even obtain images. "I'm pretty sure that in the next 10 years, we will know if it has an atmosphere and probably if it has oxygen," says Anglada-Escude, who adds that we could even see hints of any life that might there. He thinks the news that our closest stellar neighbor is orbited by a world that has a shot at possibly supporting life is sure to spur interest in an interstellar mission to pay it a visit. "It's tantalizing," he says. "Now that we know the planet is there, we can be more creative. We can think about solutions — maybe to send interstellar probes or to design specific spacecraft to look for this planet and only this planet." Ofer Cohen of the Harvard-Smithsonian Center for Astrophysics, who was not part of the research team, says he finds the evidence of the planet's existence convincing. But as to whether it is potentially habitable, "it's all down to how we define habitability," Cohen says. While the temperatures at the surface might allow for liquid water, he says, "in reality, nature is much more complicated." His studies suggest that planets orbiting this type of star need to have a strong magnetic field to protect the atmosphere from being destroyed by the stellar wind. "I was dubious that it could work out to be habitable. My first impression is that it wouldn't be," Guinan says. "And the surprise was, this planet has a chance to have a habitable climate." He and a group of colleagues analyzed the possibilities and concluded that there are plausible scenarios that would have left this planet capable of supporting life. So if he were betting, he'd now say there was about a 25 percent chance that it could be a habitable world. "To have the nearest star with a possibly habitable Earth-sized planet is terrific," Guinan says. "It's wonderful. I'm just really excited." And while 4.25 light-years might seem like an impossibly vast distance, that's practically next door in the eyes of astronomers who are used to thinking on a cosmic scale. "You can get to a tenth of the speed of light with present technology," Guinan notes, pointing out that a trip to this planet would take less than half a century. "And that's not bad," he says. "That's feasible."